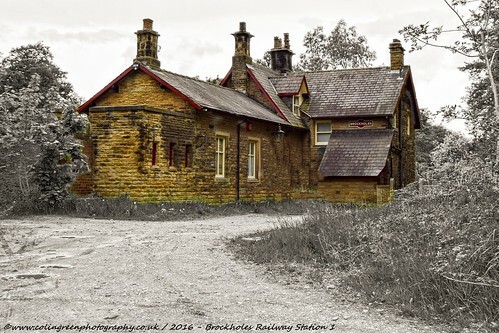 Colin Green Photography: Brockholes Railway Station, Kirklees. I originally posted this set of pictures taken at Brockholes in December 2017, I had edited them as black and white with only the one colour showing. 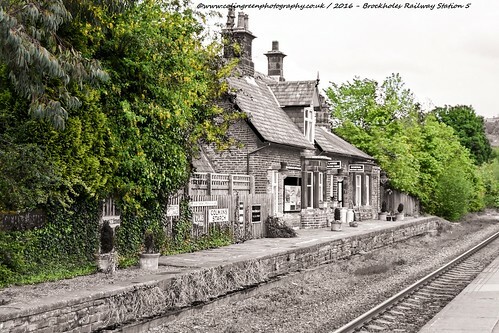 The original station buildings which are now a private residence are some of my favourite pictures and the station buildings at Brockholes with all the trees still green but the rest black and white is 1 of my most popular pictures I have ever uploaded to Flickr. I was going through the images yesterday and decided to upload a small collection of the original pictures in full colour, 4 on Flickr and an additional 1 that can be seen exclusively on Clickasnap. 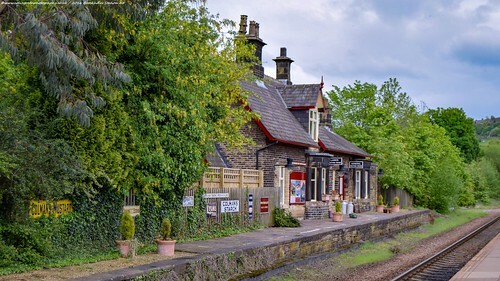 Brockholes Station serves the village of Brockholes, Kirklees approx. 4 miles south of Huddersfield, West Yorkshire. It was opened in July 1850 by the Huddersfield & Sheffield Junction Railway as a duel track station. The branch for Holmfirth left the line just south of the station until the branch closed in 1965. Staff were removed from Brockholes station in 1966 after the minister for transport refused to allow closure on the line. Closure was again threatned during the 1970's - 80's with the branch line to Clayton West closing in 1983. 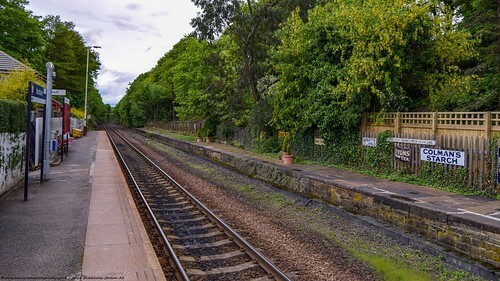 The line was reduced to single track status in 1989 with only the down platform being retained for use, although the building s had been removed in the early 1970's on this platform. The station buildings on the former up platform were turned in to a private residence and have been restored to give an heritage appeal. The pictures were taken using a Nikon d3300 SLR camera on the 21st May 2016. There are a total of 17 pictures with 10 available to view here and on Flickr and 7 available to view on Clickasnap via the link further down the page. Use the arrows to navigate the album or click to view full size on Flickr. Click here to view the album of "Brockholes Railway Station" images on Clickasnap. There are 7 pictures to view and they can also be downloaded for a small fee. The following pictures are selected from the Flickr album which can be viewed in full above. View the rest of the pictures on Flickr or Clickasnap. Thanks for looking and you can follow me on Facebook, Flickr, Pinterest, Tumblr and Twitter via the links in the sidebar. You can also subscribe to my YouTube Channel here or my photography profile on Clickasnap here. I currently have over a 1000 pictures there to view, they are a free to use site with pays a small contributor's fee to photographers for there content. All links open in another window and the copyright of all pictures shall remain mine.